One thing that is making everybody the fan of the pallet wood is its easy and feasible handling at home. 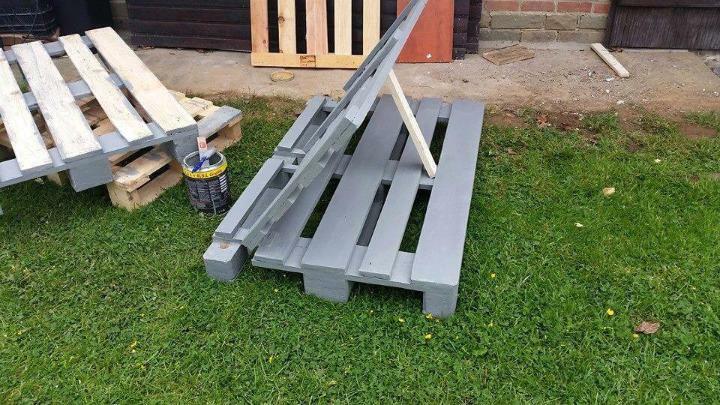 Sometimes the pallets skids with a little molding are directly used to build some particular structure of the pallet furniture. 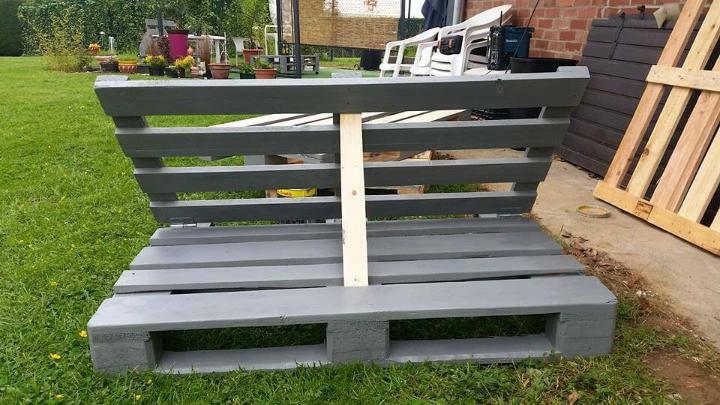 Such hassle free use of the pallet skids have been done in the making of this DIY pallet sofa chair with coffee table for the outdoor section of the house either patio, backyard or the lovely garden. 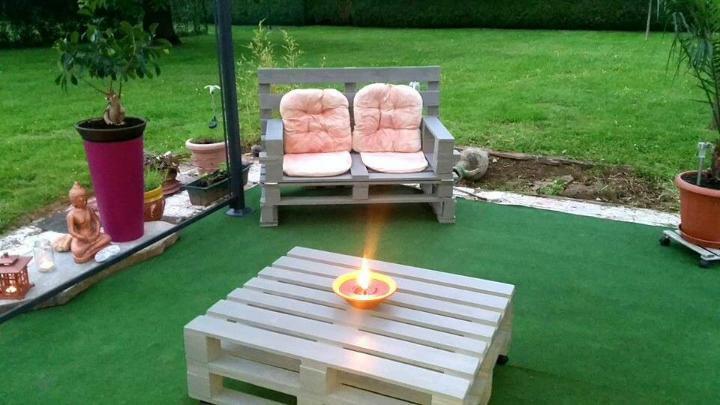 Two single face pallet skids have been layered onto each other to shape up the gorgeous pallet coffee table while you have a double face skid is acting as the pallet seat and the pallet slats have been used as the back of the chair. A smart twist has been added to the chair by making its back tilted at a bent angel using pallet plant as the hinge. This bent back would comfort your head, back and spine when you are dead tired and need some relaxation. Finished in the grey shade of the stain this seating duo looks totally graceful and decent. 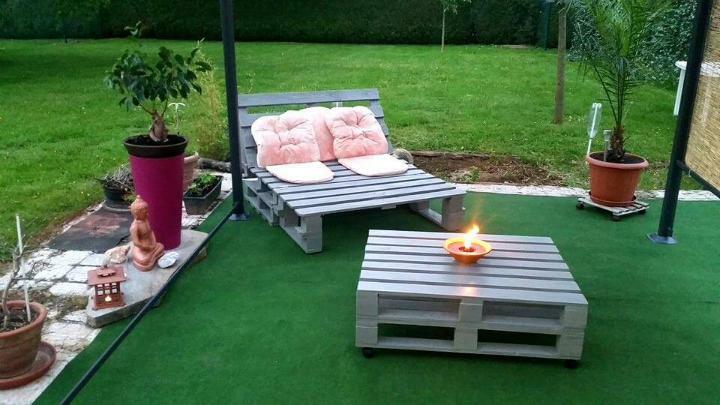 The unique thing about the pallets is that they are too adaptable to many of the furniture attires and shapes just like this cute and fun sofa seat with a coffee table for the outdoor seating section like garden and patio. Pallet single face skid has been used as the base of the chair while the same skid with dice section removed has been used as the back of the chair which has been inserted at a tilted angel for a bent back. To make the tilted backrest of the chair get supported in that bent position we have used a pallet slat piece thick in fiber and it would let you rest your head, back and spine on it when you are tired and exhausted. The gorgeous and functional seating set for the outdoors have been stained in the grayish stain of the paint which really makes this furnishing duo look subtle and gentle in the tones and adding some charm to the outdoor decor.